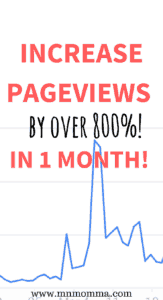 How I Increased Pageviews By 800% - In Less Than 1 Month! 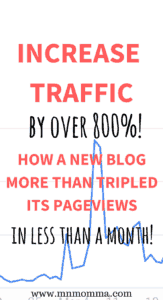 How I Increased Pageviews By 800% – In Less Than 1 Month! Yes, you read that right. 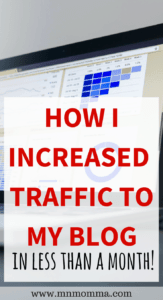 I increased pageviews to my blog by more than 800% in less than 1 month! I’m so excited and want to share with you how you can do the same thing. I started my blog in January and had over 5,000 pageviews my first month. I was so excited that things seemed to be off to a great start on their own. Then came February. In the blogging world, you’ll often hear that February is a rough month for bloggers. Well, the same thing happened to me. 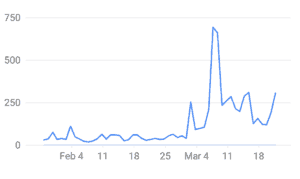 I didn’t really say much because, to be honest, I was disappointed in my February pageviews. I had dropped to 1,801 views. Here’s the problem – I couldn’t figure out what had happened. I was using Pinterest. I was using a scheduler and manually pinning. I was putting out content. What was the deal? Where did my traffic go? 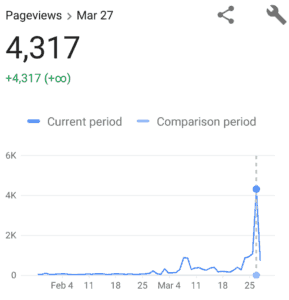 Let’s fast forward to the end of March – where I’m happily sitting with almost 15,000 pageviews in my blog’s third month. A pretty drastic improvement over the 1,800 February pageviews. *Update: I ended March with 19,787 pageviews. Making the results an over 1000% increase from February. 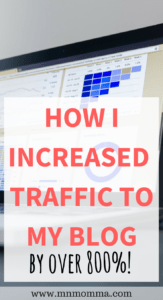 How I Drastically Increased My Blog’s Pageviews – and Fast! I read a Facebook post. Okay, so that’s not the whole secret – but it’s where things started. The post was about blogging courses and eBooks. There are so many courses that claim to be the very best and the one you need. But it can be overwhelming to pick one. While skimming through the post I saw a comment that stuck out at me. 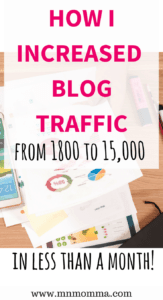 Someone stating that a blogging club had helped her build her blog to over 400,000 pageviews. As I looked closer there was another comment. This was a comment from the course creator himself! Paul Scrivens, from Dare to Conquer (formerly Billionaire Blog Club), was in the Facebook group and was helping answer questions. Paul mentioned that another blogger could e-mail him if they had questions. So I thought, well if they can email him – why can’t I? Hey, if you never ask, the answer is always no. I quickly e-mailed Paul about whether my blog might be a good fit and if he could help me. The best part? He emailed me back right away. And that hasn’t changed since I’ve signed up for BBC. Paul has successfully started 7 different blogs in different niches to help teach how to be successful in each one. He’s not just a blogger blogging about blogging, he’s the real deal. He’s always trying to learn more himself and help the members of BBC succeed! 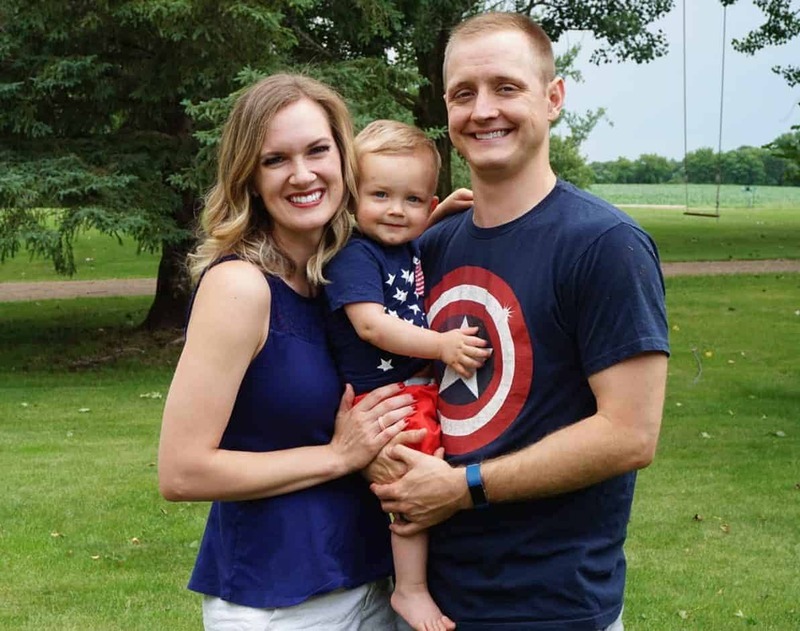 I mentioned my goals to him, and that included increased pageviews, and he helped develop a plan with me to help my blog succeed. Okay, so I’m sure you’re wondering, what’s the course that really made the difference and increased pageviews? The course that helped skyrocket my pageviews this month was the Pinterest Manual. I started to implement the strategies on March 2nd, and by March 3rd I was already seeing results! If you’re looking for the one book to help your blog, you need to try this one. I was using Pinterest before, but I was doing it all wrong. I didn’t have a good strategy, I had 1 pin for most posts, and was not utilizing my Pinterest boards the way I should have been. Paul’s course changed all that and watching the growth since implementing his strategies has been so exciting! I even found myself e-mailing Paul a few days after seeing success, because I wanted to share the great news with him. My success didn’t end there. As you’ll notice in my Google Analytics report, you can see my pageviews continued to climb throughout the month, reaching over 4,300 pageviews in one day. With some hard work, I had increased pageviews higher than I had ever expected in my first month with BBC! Paul offers a few options for bloggers interested in his content. You can buy his eBooks and courses individually, or you can purchase all of BBC and have the access to everything for a lifetime. If you’re new to blogging and unsure if BBC is for you, you need to try the FREE 12-Day Blogging Bootcamp. I saw great results and it gives you a good feel of what BBC is like. For me, the price was a little high as a new blogger to purchase all of BBC, not as high as other courses, but no few pennies either. However, it was created to be the only blogging resource you’ll ever need. No more searching or budgeting for future courses. It’s all at your fingertips. After talking it over with my husband and hearing that Paul thought he could help me, I purchased a BBC lifetime membership. I didn’t want to ever be tempted to buy another course, and knew if I wasn’t understanding something or had questions, Paul would be there to help. Paul is also not your usual “blogging is perfect”, type of guy. His personality and delivery is refreshing! Plus, he cuts the fluff, something I just don’t have time for. I’m so excited to say that Dare to Conquer (formerly Billionaire Blog Club) is the only blogging resource I’ve ever purchased AND the only one I ever plan to purchase in the future. BBC has been closed for new members during March for some updates, but you can expect it to reopen April 5. I can’t recommend it enough! Whether you’re a new blogger or an experienced one just looking for the right course to help give you a little “extra” – check out BBC, it just might be what you’ve been looking for. If you’re on the fence, try Paul Scrivens FREE 12-Day Blogging Bootcamp for a taste of BBC!